As a historian I’d been well aware of Brabant as one of the major Duchies of medieval Europe, but apart from occasionally noticing the name on “Welcome to...” road signs while whizzing through the Low Countries, I have to confess I’d not really been aware of its modern existence. Until this week, that is, when VisitBrabant invited me and several other beer writers & bloggers to, well, visit Brabant and discover its beer. While you might not have connected the two before, it turns out Brabant – which includes Eindhoven, Breda and Tilburg, as well as its ‘capital’ of De Bosch – has a long brewing heritage. From our base at the aptly-named Hotel Central in Den Bosch (aka s’Hertogenbosch, which means the Duke’s Forest), we first sallied out to Koningshoeven Abbey, the home of La Trappe, one of the original Trappist breweries. More on that in a later post. Keen cyclist Nathalie from VisitBrabant then lead us on an hour-long bike ride to the village of Oirschot – it’s a great country for cycling, being relatively flat and having plenty of dedicated cyclepaths, and luckily we had great weather. Oirschot was formerly home to Kroon, one of the few regional Dutch brewers to survive the massive waves of consolidation during the 20th century. It was finally bought in the 90s and closed in 2000 – oddly enough it was a victim of its new parent Brouwerij Bavaria subsequently also linking up with La Trappe and not needing the Kroon brewery any more. Then two years ago, a new brewery called Brouwerij Vandeoirsprong opened on the Kroon site, aiming to combine traditional styles with a bit of new-wave pizazz. We liked the Vandeoirsprong taproom, and from what I hear so do the locals, flocking at weekends to what’s now the village’s only brewery – it of course had over a dozen before the closures of the late 1800s. Why did they close? Newly fashionable Pils, in large part – if you had no cool caves nearby, the shift to lager beers required significant investment in refrigeration equipment. As elsewhere, many smaller breweries could not afford this and closed or sold up, a process exacerbated by the large brewers wanting to expand by consolidation and acquisition. Anyway, the taproom is in the old bottling hall and has an industrial chic, all white tiles and concrete. 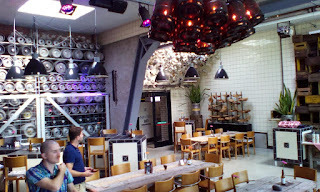 There is also a brewery museum with the old Kroon brewkit and all sorts of other gear and memorabilia, it’s only labelled in Dutch for now but I think that will change. The beer garden too is littered – oops, I mean decorated! – with old brewing gear such as wort coolers. If I’ve one caveat about Vandeoirsprong, it’s that they might be trying to produce and sell too many beers too soon. I think they had eight of their own on tap, and while the Hop-Wit and OPA were pretty clean and tasty, some of the others seemed a little rough around the edges and needed work. But it is only their first full season in operation, their brewer is still learning, and I’m sure they will all improve. 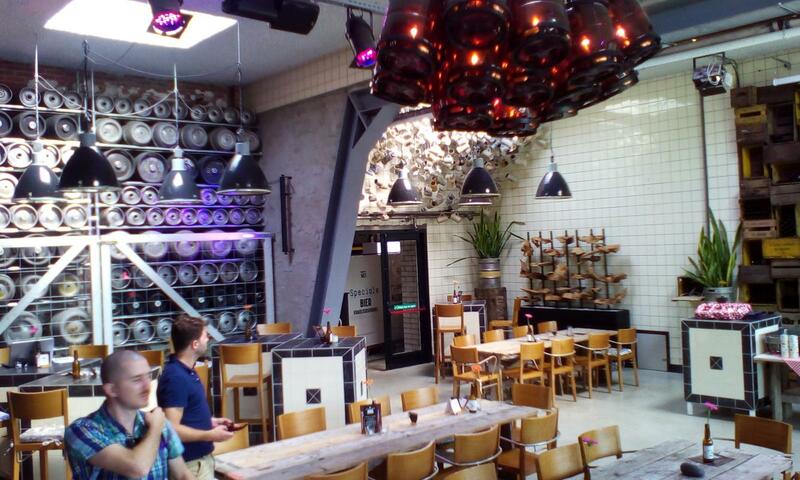 The third brewery of the day was back in Den Bosch. Stadsbrouwerij van Kollenburg t’Kolleke is the house-brewery at Cafe Bar le Duc. 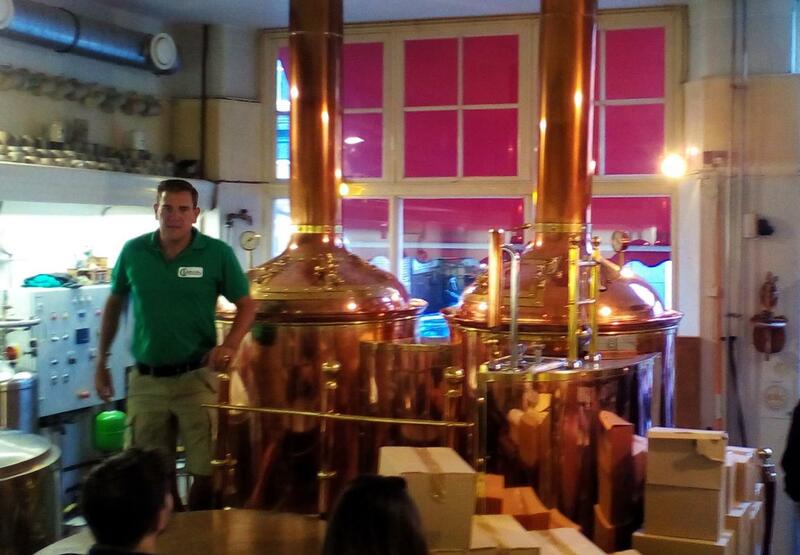 It’s now the only brewery in the old city, although there is a large Heineken factory on the outskirts – again, there would have been dozens in the Middle Ages. Brewer/co-owner Jan van Kollenburg sells around 80% of his production sells through his bar, with the rest being a mix of bottled off-sales, and supplies to others bars around town of a new beer called Jheronimus, produced to mark the 500th anniversary of the death of eponymous local artist Hieronymus Bosch. Bar le Duc has the look of a classic old cafe, all brown wood and beery memorabilia. As well as an excellent local food menu and Jan’s beers on tap, it also has guest beers and a bottle list – the primary focus for both being the Low Countries with just a few outliers, such as the one American Trappist beer and a beer each from Spain and Germany. The house beers were variable, but the intriguingly herbal Blond and the Dubbel with liquorice were both pretty good, as was the Jheronimus. Den Bosch looks like a really good city for beer bars - as well as Le Duc there's several more in the old city, including to my surprise a bar belonging to top English brewery Thornbridge. Maybe that's why all the other bars around have little or no British beers! Technically we’re in North Brabant, the only quarter of the old Duchy that stayed in the Netherlands when Belgium split off in 1830 – the actual history is more complex, this is the simple version! The other Brabants are even more beery, in particular Flemish Brabant which contains several well-known abbey breweries (eg. Affligem, Grimbergen) and whose capital of Leuven is the home of Stella Artois. Nathalie mentioned that as well as the touring cycle routes on her side of the border, there is a Trappist cycle route that visits the Belgian Trappists as well as La Trappe. Now there’s a good way to build up a thirst! Caveat: we all paid for the tour ourselves, however we were at the same time the guests of VisitBrabant who booked the beer tastings and covered our hotel stay. It was a brilliant day out Bryan, and a great way to start this year’s EBBC. Nathalie certainly set a fair pace on her bike, and it was as much as I could do to keep; especially on an unfamiliar bike where the way to brake was pedaling backwards. Considering this evening’s heavy rain, we were really lucky with the weather. Just wish we had a network of cycle paths like that, back in England.